Just can view CHM tutorials on computer? Now, 4Media CHM to EPUB Converter can help you convert CHM files to EPUB format eBooks conveniently and easily for viewing on various mobile devices. It preserves original text, graphics, images, hyperlinks and layout of the source CHM files. You can also customize the EPUB file information by editing its name and author or browse a picture you like as the cover of the EPUB eBook. Batch conversion is enabled as well to boost the converting performance. 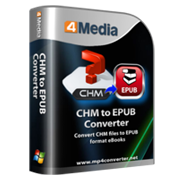 4Media CHM to EPUB Converter enables you to convert CHM files to EPUB format eBooks and facilitate you to enjoy on portable digital devices. 4Media CHM to EPUB Converter allows you to customize the output EPUB eBook by editing name and author information, you can also browse a picture you like as the cover of the EPUB eBook. Superior performance and speedy processing will surprise you too much and bring you the most satisfying quality of output eBooks. All the original elements of the CHM file after conversion, such as text, graphics, images, hyperlinks and layout can be retained perfectly after conversion. Exit/ standby the program, hibernate/shutdown the computer or no action after the CHM to ePub conversion tasks are finished. Perform the conversions at the background to spare more resources for other applications.